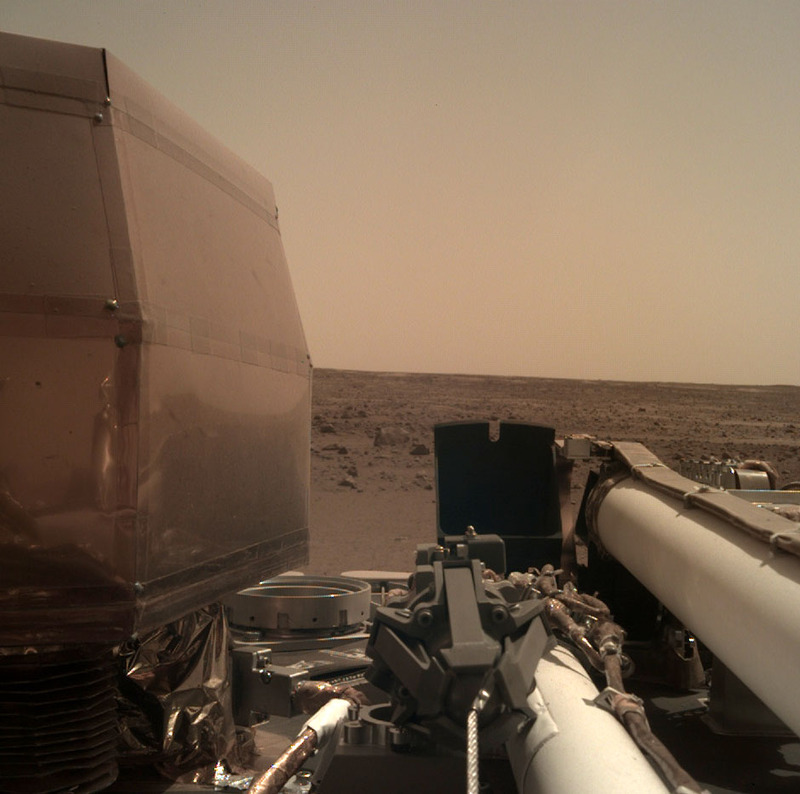 A photo of InSight's robotic arm with Mars' horizon in the distance. Photo courtesy of NASA/JPL-Caltech. 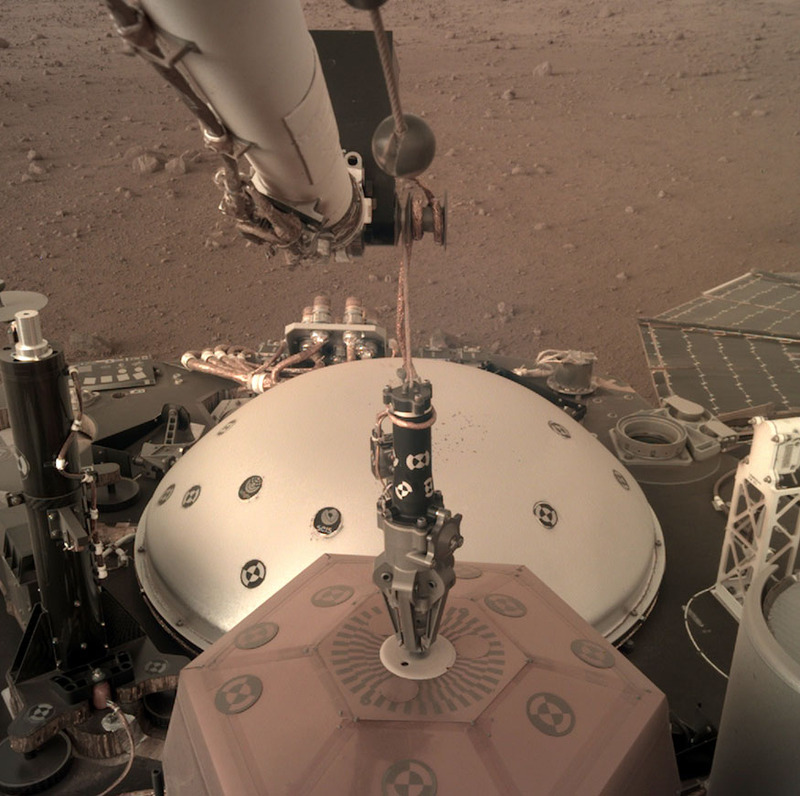 A photo of the InSight lander's robotic arm and equipment resting on Mars' surface. Photo courtesy of NASA/JPL-Caltech. CSUN Student and JPL Intern Heather Lethcoe smiles inside the Jet Propulsion Laboratory. Photo courtesy of Heather Lethcoe and NASA/JPL-Caltech. On Nov. 26, California State University, Northridge student Heather Lethcoe watched in awe as NASA’s InSight lander approached the dusty, clay-red surface of Mars — headed for the target Lethcoe’s team helped identify. Mars is about 140 million miles from Earth. Lethcoe, a geographical information science (GIS) junior, and a team of scientists at NASA’s Jet Propulsion Laboratory selected the ideal landing spot for InSight and its equipment with the aid of high-resolution images and data collected by NASA. 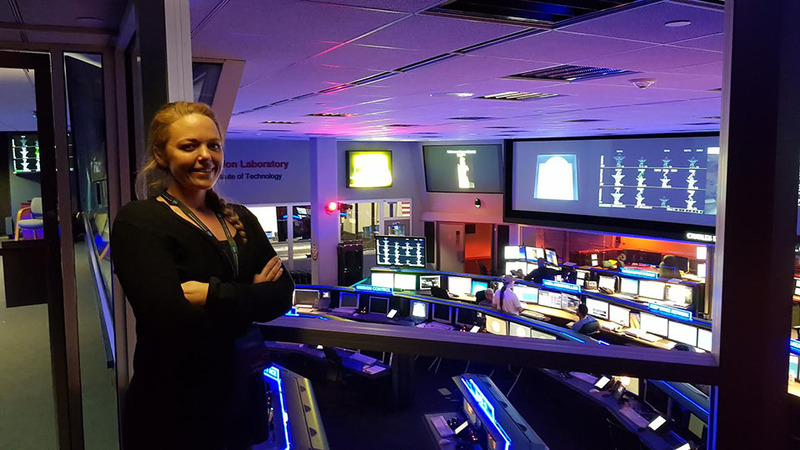 As an intern at JPL, Lethcoe’s job with InSight was to conduct surface operations. Specifically, she was tasked with selecting the best landing site for the two instruments aboard InSight — a seismometer and heat probe — which are designed to explore the interior of Mars. Lethcoe works with two other interns under the supervision of Matthew Golombek, project scientist for the Mars Exploration Rover mission, and Nathan Williams, a planetary geologist with particular interest in the remote sensing of planetary surfaces. InSight, short for Interior Exploration using Seismic Investigations, Geodesy and Heat Transport, is a lander with a mission to map out the deep structure of Mars. It’s the first robotic explorer to study in-depth the inner parts of the Red Planet, including its crust, mantle and core. Studying the inner layers of the planet could reveal new insight about the early formation of planets in the inner solar system, including our own. InSight’s seismometer and heat probe will study the planet from just one spot. The instruments will search for signals below Mars’ surface, such as marsquakes and heat. Lethcoe has been deemed the “mapping expert” among her fellow interns because of her expertise in studying the images of Mars’ surface and then identifying the best potential landing sites for the lander to conduct its research. These high-resolution images are printed from geographical information software that Lethcoe and her team examine, searching for areas near the planet’s equator that are flat, smooth, low-lying and likely to be obstacle-free from things like rocks or hills. Finding potential landing sites was no easy feat. The lander operates by using power from solar panels, so the site had to be as close to the sun as possible, making a spot close to Mars’ equator ideal. Subsurface soil is also key to a lander’s success, as it is softer, less rocky and the lowest point on the ground. For these reasons, Lethcoe and the team chose a plain called Elysium Planitia, which is a flat, smooth plain just 4 degrees north of the equator. Landers are different from rovers in that they are not mobile. If something went wrong, like a rock blocking the robotic arm of the lander from being able to extend itself and hammer the equipment into the ground, or a small hill forcing the lander to be off kilter, the lander would not be able to do its job. Their research paid off. Lethcoe credited her background as a U.S. Army Geospatial Engineer as being incredibly helpful to her work at NASA. Lethcoe was quick to add that no student should feel like an internship or job at NASA is out of reach. As a busy intern and full-time student, Lethcoe noted that her professors at CSUN have been incredibly understanding and flexible with her schedule. Lethcoe plans to continue her education with the goal of obtaining her Ph.D. in geology or planetary science and becoming a full-time employee at JPL. At JPL, Lethcoe is currently working on Mars 2020 related projects.